Welcome to Dana Middle School. It is my belief that, though all students can learn, students are not always in the cognitive and/or emotional space to learn. It is for this reason that Dana Middle School employs a trauma-sensitive approach to instruction and operations. The trauma-sensitive approach focuses on building relationships, both student-to-adult and adult-to-adult, in an effort to create an environment of support and understanding so people can be successful when they are at their best and, most critically, feel supported and understood when they are not. When someone demonstrates dysregulated behavior (traditionally viewed as "naughty" or "unacceptable"), the goal is to respond appropriately in the moment while also giving long-term focus to addressing the root causes for such behaviors. This concurrent approach to behavior support allows students and adults to feel less judged when not at their best (dysregulated), and ensures they are supported along a path towards minimizing instances when such moments and behaviors recur. This is particularly noteworthy when many students and adults struggle daily with whole-life challenges that make constant regulation challenging. Because dysregulated behavior can manifest in a variety of ways (rudeness, violence, truancy, explosiveness, avoidance, isolation, etc.) and occur for a variety of reasons (emotional distress, depression, physical distress, housing/food instability, gender identification, etc. ), each of the above organizational elements focuses on providing a specific area of support for students and adults, based on the need. Though there are a multitude of factors outside of the control of the school that influence the behaviors and regulation of those who arrive each day, I firmly believe that our ability to demonstrate love and understanding is not one of them. We can always be loving and caring adults. These demonstrations of care and structures of support build the relationships and foundation which lead to continued success for those who arrive with a history of excellence, and ultimately establish a pathway to success for those who previously felt disconnected and/or under-served. 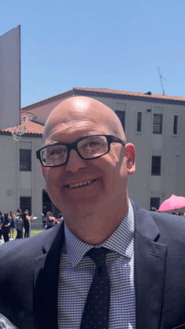 If you would like more information about the program or structure of Dana Middle School, or would just like to discuss the progress of these initiatives beyond the top-level data, I invite you to contact me at 310-241-1100.